It has been a little quiet on the blogging front this week only because I have instead spent time behind the sewing machine. Not only have I started and finished a quilt that I cannot as yet show you (which I am pretty excited about!) but have also pieced a quilt backing for the Strips and Bricks Quilt II top pieced last week and basted the quilt sandwich. I was so nervous about basting this large quilt as it really dictates how smoothly the quilting will go. 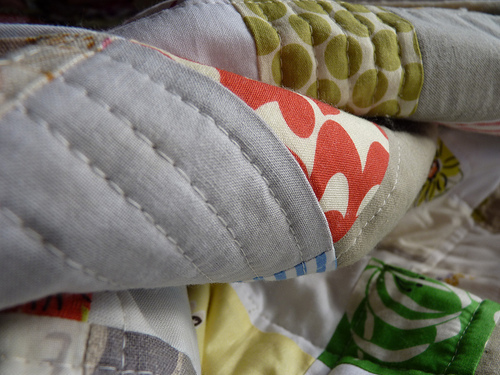 I find it very difficult to cope with fabric pulls and puckers particularly for custom quilts. I need not have worried so much, and should have had more confidence in my own basting technique, as in fact I am very pleased with how the quilting is going. I started quilting by creating a foundation grid to stabilize the quilt sandwich. Lines were quilted both horizontally and vertically by stitching a 1/4 inch inside of the strips of the quilt that will be filled with quilting lines. Now that the foundation grid is finished I have started filling in the strips by quilting organic lines. I have not marked any of the lines, instead I have been using the outside edges of my walking foot as a guide for stitching the next line. There is still a LOT more quilting to go, and let me re-assure you that whilst I am sitting behind my sewing machine I will be getting a very physical work-out as a I wrangle with the bulk of the quilt, and hoist it over my shoulder to ensure that the lines are continuous and straight. Muscle building for sure. Your hard efforts are paying off. But I have to say wrestling a large quilt in my home sewing machine was what drove me to get my long arm 10 years ago. My back and neck are so much better off. Is that one of things that you won't be able to show us for 6 months? It's beautiful, whatever it is! Love that quilting and I'm going to try it on the next quilt that I make that lends itself to the technique! This looks gorgeous! I have a question about your foundation grid. 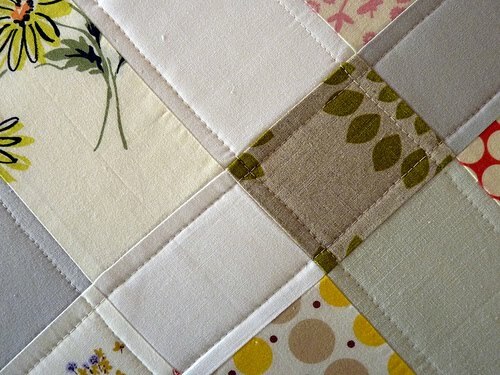 When you quilt those lines, do you start in the middle of the quilt and then work your way out? Or do you start at and edge and sew all the way across? Also, if you do start in the middle, how do you hide your thread ends? I'm interested in how others do this, as I haven't found a method I really like just yet. Jennifer: thanks for your question - when quilting straight lines I always start at the edge of the quilt and stitch continuously to the other side of the quilt. I back stitch both at the start and end of each stitching line. I do start stitching lines from the center (at the top) of the quilt and then work my way out one line at a time. This time I stitched all the horizontal lines and then the vertical lines. Lovely quilt and quilting! I tried straight line quilting yesterday - thanks to all the tips about it from you on here especially stitch length. I love how your idea of 'organic' still looks so bloody perfect!!!! Intrigued about the secret quilt project!! Ooooh, I love it! Those quilting lines are fabulous! Looking forward to the secret project being revealed! It is a work-out, isn't it? Looking fantastic so far. Heavy quilts really are such a work out. You must have very toned arms! I finished my Bricks & Stones quilt a few weeks back - I would love for you to take a look and give me your critique`! Loved your PDF pattern btw - very easy and clear to read. Oh Gosh! I can imagine the work out on your sewing machine. My turn will soon come and I am dragging the thought of just sewing the backing for my quilt! I really love your quilt colors and can't wait to see the finished project! 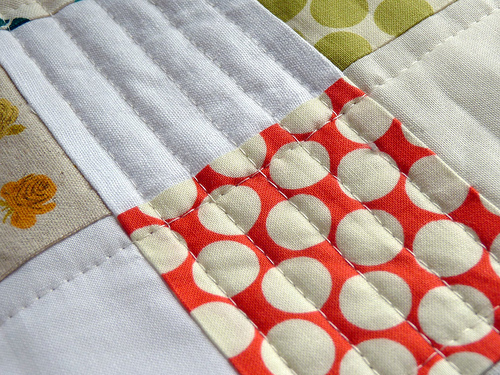 Your quilting lines are always so immaculate and the fabric so flat! Not even a hint of puckering- envy! That quilt is stunning! I may have to make one similar :) Have you ever shared your basting technique? I've never seen such a tight, flat quilt sandwich before! I LOVE your blog, it is so inspiring!! I am busy with my first ever quilt, and I could only dream of it being so flat. Can't wait to see this quilt finished!! Thanks for updating your blog so often, I check back here nearly every day, and it's lovely to have so many inspiring posts coming from you. Rita - your stitching is a picture of perfection. Have you explained what "organic" stitching is? I'm assuming it has to do w/ the stitch length? Can't wait to see the finished quilt! this is going to be a lovely quilt! my attempt at straight line stitching was a huge failure. lots of puckering and crooked lines. you are inspiring me to try again since it looks so good! can't wait to see the finished quilt! This is turning into another stunning quilt - the effort with quilting will be well worth it. Just don't stay up too late tonight! No kidding! I am quilting a behemoth right now and gosh I'm sore. Almost done though! Rita, you quilts are so flat, your lines are so straight. Sheesh, it's amazing! I guess I need to machine quilt a medium-sized quilt to get me some practice! Looks gorgeous and I know just how you are feeling. It's a bit like wrestling a python! Jennifer has asked the same question as I would have asked. 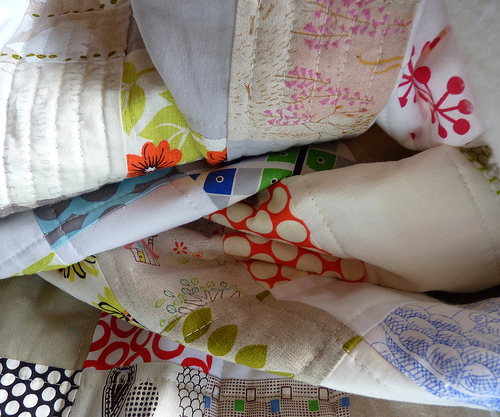 I try to anchor my quilts by starting in the middle and stitching outwards horizontally and vertically however I always get puckers and wavering on the backing even though the front looks fine. Also sometimes at the crossroad of a vertical and horizontal line they meet and fold at the corners. There must be more to your technique than just sewing. 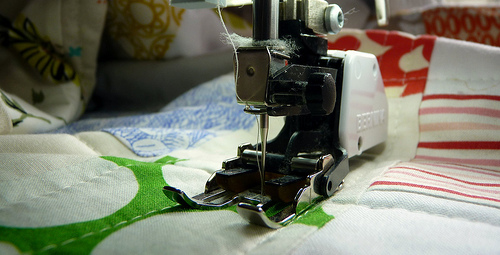 Do you use a 1000 pins or stiffen the fabric first? I just don't know how to get it so neat. Any further tips would be great.